Winter has arrived in Colorado. We've had three or four snowfalls and some frigid temperatures. I was shivering last Sunday night and cursing the thermostat when I glanced at the weather report: -12F! I guess that's why the thermostat wasn't able to keep up. In other news I had some avian adventures in the house. 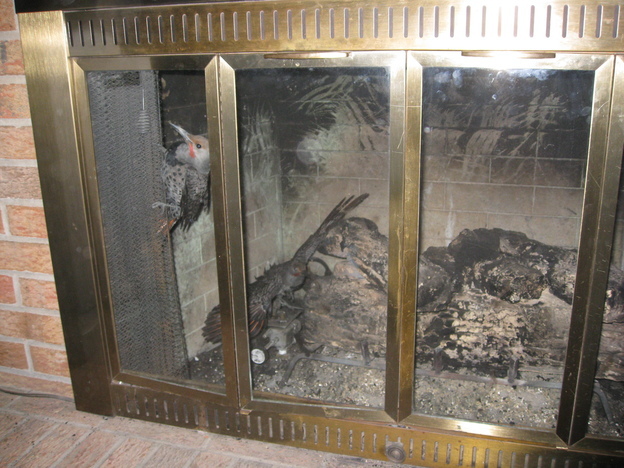 Somehow two medium sized birds managed to get into the chimney and all the way down into the fireplace. Trapped behind the glass doors and flapping around on the gas logs, they made a good amount of ruckus. I assembled various makeshift devices to try to get them into a big box and then transport them to the back porch and let them go. The glass doors open with a single hinge and sliders in such a way that is is not possible to open them without giving the birds a chance to escape and go flying around the house. In one of the early attempts, one black bird did get past me and fly into the living room. Luckily he made just one hop and then immediately went out the open back door. That left one big woodpecker in the fireplace. Realizing my chances of getting him outside were pretty slim, I called the maintenance guy. He came the next day and decided the bird was big enough that we should call an animal control company. So with that extra delay I slipped a piece of whole grain bread into the fireplace to offer him some sustainence until the company could come Saturday morning (I had discovered them in there Wednesday evening). Luckily though, the company was able to come earlier than planned and a young guy just put on a pair of gloves, grabbed the bird, and walked it outside. I was anticipating some elaborate net to cover the entire fireplace. Anyway, he said he thought the piece of bread may have made the difference, so I was glad to have done that. I'm currently in the air flying from Denver to Philadelphia for a nice week with the family. I haven't seen my parents since June. I can't remember a prior time going six months without seeing them at all. I'm also excited to see my sister who is five months pregnant.